Morgan’s Mountain is rich and just a little bit chocolatey. I like how this one makes more judicious use of Kahlua and Creme de Cacao than so many recipes that seem to think more=better when it comes to those. You really only need a touch of either, and that’s what you get – a half-ounce of Creme de Cacao and a mere teaspoon of Kahlua. Light rum is the basis for this one, and an ounce of cream rounds out the flavors. 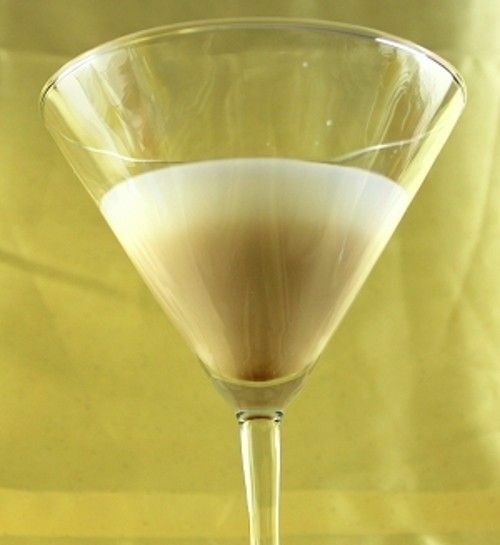 This is a nice after-dinner drink or nightcap – smooth and lightly sweet. And it looks good too, with the Kahlua dropped down the middle to form a layer. I recommend putting your Kahlua in a spoon – or better yet, a small syringe – so you can drop it precisely where it should go to get the look. Fill a cocktail shaker halfway with ice rubes. Pour in everything but the Kahlua and shake until chilled. Strain the mixture into a cocktail glass, and drop the Kahlua right down the middle of it so it forms a pooled layer at the bottom.